The disease necrotic enteritis was first described in chickens in England in 1961 and since that time has been reported in the majority of countries around the world. Necrotic enteritis has been identified in broilers, laying hens, turkeys and quail. Necrotic enteritis has been estimated to affect up to 40% of the commercial broiler flocks and is believed to cost the industry about 5¢ per broiler in the United States (McDevitt et al, 2006). Necrotic enteritis is caused by toxins produced by Clostridium perfringens as it grows in the intestinal tract of birds. Clostridium perfringens is a bacterium that grows under anaerobic conditions (in the absence of oxygen) and produces spores that are highly resistant to drying, heat, acid and other harsh conditions. The spores produced by this organism are commonly found in water, soil, feed, manure and other environmental sources. Although, small numbers of Clostridium perfringens are also commonly found in the intestinal tract of healthy broilers, they do not cause disease. Under normal conditions the “good bacteria” in the intestinal tract keep the Clostridium perfringens population small in number. However, when conditions change in the intestinal tract, Clostridium perfringens numbers increase, toxins are produced and the disease appears. While anything that causes intestinal irritation can lead to necrotic enteritis, stress; intestinal disease (particularly coccidiosis); intestinal parasites (especially round worms); and immune suppression by mold toxins (mycotoxins), chicken anemia virus, Gumboro disease or Marek’s disease have all been specifically linked to the disease. Necrotic enteritis is commonly seen in 2-to 5-week old broiler chickens raised on litter and in 7-to 12-week-old turkeys. At times, the only symptom the clinical (severe) disease is the rapid and unexplained death of the bird. When symptoms such as severe depression, decreased appetite, dark colored diarrhea, closed eyes or ruffled feathers appear they are often short-lived because birds die rapidly. Dead birds appear dehydrated and seem to rot very quickly from the inside out. The disease will linger in the flock for 5 to 10 days, causing 2 to 50% mortality (Merck Veterinary Manual, 1998). While symptoms of the clinical (severe) form of necrotic enteritis are fairly easy to recognize, the sub-clinical (mild) form of the disease is not so easily recognized. Birds with mild necrotic enteritis may simply look like they don’t feel good and/or may gain or perform poorly (Kaldhusdal and Lovland, 2002). Yet, scientists believe that the mild form of necrotic enteritis has a much greater impact on flock performance and profitability than the severe form. CHECKING THINGS OVER - Dr. Dustan Clark, poultry veterinarian at the Center of Excellence for Poultry Science, does a routine check of a bird. Antibiotics such as bacitracin, penicillin or lincomycin can be used to treat the necrotic enteritis, but it is often impossible to effectively use antibiotics since the disease progresses so rapidly and the toxins involved produce irreversible intestinal damage. Thus, it is most often easier to prevent necrotic enteritis rather than treat it. Unfortunately, it is not always possible to address every situation that may lead to the onset of the disease. Still, in view of the performance and economic issues involved, it is important to address all the issues possible, including: keeping bird stress to a minimum, maintaining feed storage and delivery systems, vermin control and coccidiosis control. Any factor that causes stress in the bird can alter the intestinal environment, allowing Clostridium perfringens to grow and produce toxin. While stress can come from innumerable sources, the proper set-up and management of poultry house environment is the most obvious method of controlling stress. Since it provides the power and raw materials required for the bird to grow, it is also important to properly handle feed. Feed that has been allowed to become old, damp or wet will encourage mold growth and possibly toxin (mycotoxin) production and should not be used. Almost all mycotoxins reduce disease immunity in the bird and certain mycotoxins are known to irritate the intestinal tract. Even if mycotoxins are not present, moldy feed is unpalatable and contains fewer nutrients that fresh feed. Hence, it is important to ensure that feed handling and storage equipment is properly maintained. Rodents and wild birds (vermin) are often found to transmit disease organisms and parasites. Since, such microbes and pests can either cause disease or stress in the flock, it is imperative that these vermin be controlled. Intestinal damage from the disease coccidiosis can easily allow an “opening” for necrotic enteritis to develop. 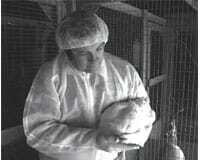 Thus, it is extremely important to ensure that coccidiosis does not develop in the flock. While all poultry companies maintain coccidiosis control programs, inadequate management practices can threaten these programs. Perhaps, the most important management practice involved in the control of necrotic enteritis is the regular collection and disposal of the dead. If the dead are not frequently collected, the cannibalism will occur, exposing other birds to large number of Clostridium perfringens, spreading the disease. Kaldhusdal, M. and A. Lovland. 2002. Clostridial necrotic enteritis and cholangiohepatitis. Proc. The Elanco Global Enteritis Symposium, July 9-11, 2002 at http://www. poultry-health.com/fora/inthelth/pdfs/kaldhusdal02.pdf visited 5/18/07. McDevitt, R. M., J. D. Brooker, T. Acamovic and N. H. C. Sparks. 2006. Necrotic enteritis; a continuing challenge for the poultry industry. World’s Poultry Sci. J. 62:221-247. Merck Veterinary Manual. 1998. Necrotic enteritis. http:// www.merckveterinarymanual.com/mvm/index.jsp?cfile=htm/bc/201200.htm visited 5/18/07.